This is a free Mug Shot board that will allow you to know immediately who it is you took a picture of at the local jail or in your bail bonds office. 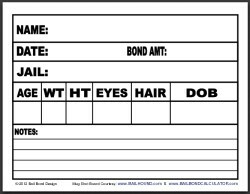 Simply print off the free mugshot board (which is a PDF file) and hand out as many copies as you wish to your bail bondsmen. Ensure they fill out the board neatly and make doubly sure the person in the image is holding it under their chin or close to their face (just in case you want to crop the image). When you get back to your office you simply take the Mug Shot Board and place it into the defendant’s folder along with pictures you will print out. This again ensures all the information about the defendant is listed in your folder should anything happen to your network, online database or other media. So, to keep all your client’s in check and to know what they look like plus some added information, click the button below to download your free Mug Shot Board now.